Hey gang. Last year, I did my Oscar picks over five or six days, looking at every single category and making fearless predictions. I don't remember how well I did, which much have meant that I didn't do very well. I remember when I succeed. This year, I'm keeping it short and sweet. Only the Big Eight categories. That doesn't mean I won't have emotional investments elsewhere. I would love to see the confusion to follow a Roderick Jaynes editing win. I would celebrate the humiliation of the Academy giving an award to "Norbit." I want Dario Marianelli to win for his "Atonement" score and Glen Hansard and Marketa Irglova to win for "Falling Slowly." Dark Horse: There's a lot of support in many categories for "Ratatouille" and if the Academy feels like throwing a coronation party for Brad Bird, he could sneak in with a win. 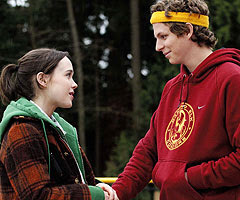 Should Win/ Will Win: Sorry, but I still like Diablo Cody and I still like her script for "Juno." I'm not gonna play idiotic "backlash" games and I'm not going to make a stupid joke about her stripping past. For the love Pete, guys, don't misrepresent the story: She stripped so she could write about stripping and because she thought it would be a funny thing to do. Maybe if more Hollywood screenwriters took time to have real occupations (or even funny joke occupations) they'd writing more interesting scripts. Just a suggestion. Dark Horse: If Ronald Harwood doesn't win for "The Diving Bell and the Butterfly," this overrated experimental film won't win anything. I wouldn't find that at all sad, but maybe the Oscar voters would. Should Win: I would love to see what Sarah Polley would say if she won for "Away From Her." That would be spectacular and a nice validation of her gifts. Will Win: The Coens did a marvelous and literal adaptation of "No Country For Old Men." Good for them. Dark Horse: All over the Net, folks who do this stuff for a living are going out on a limb and predicting Tilda Swinton will win for "Michael Clayton," which is a cute sort of hypocrisy. For months the Oscar pundits blather about predictive evidence, about bellwether awards and guilds and critics groups. But now many of those folks are predicting Swinton and all for the exact same reason: "Michael Clayton" isn't going to win anything else and Oscar likes spreading the wealth. And if every Oscar voters does, indeed, decide to think exactly like an online Oscar pundit, I agree with this choice. Swinton's very good and it would be career recognition. Should Win: Bad accents are tough to overcome and Amy Ryan's accent in "Gone Baby Gone" is often a problem. But I rewatched the movie a couple weeks ago and was blown away by her performance. The first time I watched, I was appreciative, but I confess I didn't think it was award-worthy. I do now. Will Win: Rudy Dee, who allegedly appears in "Gone Baby Gone," but is most certainly worth of recognition for one of the most important careers in the entertainment industry. Honor Dee and you honor six decades of struggle and questing for equality. You honor Ossie Davis too. And, heck, you honor a somewhat well-respected movie that made more money at the box office than any best picture nominee other than "Juno." If you honor Cate Blanchett, it's just a way of saying, "Hey, way to play another famous person, Cate." Dark Horse: If the Golden Globes would have gone with Casey Affleck, it wouldn't have been a massive upset. Welcoming young stars into the club is what the Globes do. Welcoming old stars into the club is what the Oscars do. That why the dark horse here is Hal Holbrook. Should Win/Will Win: I can't see Javier Bardem losing for "No Country for Old Men," nor can I see any reason not to be completely content with that possibility. As embodiments of shaded malevolence go, Bardem's performance may be the best of its type since Anthony Hopkins in "Silence of the Lambs." Hopkins won best actor. Bardem probably had more screentime, but he'd got supporting in the bag. Dark Horse: I know it's the predictable answer, but Ellen Page is the dark-horse here. I'd feel more confident in her chances if she'd pulled off a single head-to-head upset against somebody in this category during the award season. But she didn't. Even her Indie Spirit win on Saturday came against a weird field that included Sienna Miller and Parker Posey. Should Win: It's time for Laura Linney to have an Oscar and in an ideal world, she'll get it soon, when she deserves it, rather than a few years down the road when she resorts to playing a woman with a wasting disease. Her performance in "The Savages" is never award-baiting (Away with you, Marion Cotillard), it's just good. Will Win: I have no problems with Julie Christie winning. She was good in her movie and she'll thank Sarah Polley and Gordon Pinsent. That would be just ducky. Dark Horse: It's important to keep patting George Clooney on the head whenever he does good things. Otherwise, he'll do another "Batman" movie. And his performance was far from my problem with "Michael Clayton." Should Win: I've said this enough times already: The best male acting performance of the year was Viggo Mortensen's in "Eastern Promises." Frankly, I'm just glad it was nominated at all. Will Win: Daniel Day-Lewis acts the roof off in "There Will Be Blood." In think he *even* plays a character in a movie. But mostly, he ACTS. He hasn't had an Oscar for 20 years. Might as well give him another. No harm. Dark Horse: How about if the Oscar voters decide that after giving best screenplay, best picture and best editing to the Brothers Coen, they just decide they're tired of 'em? And they decide to reward Paul Thomas Anderson for orchestrating the tremendous weirdness of "There Will Be Blood"? That would be wacky. Should Win/Will Win: Even if something weird happens and a different film wins Best Picture somehow, I can't see the Coens not earning a well-deserved first best actor trophy for their first officially credited directing collaboration. Dark Horse: There's only "Juno" and even that requires pointless rationalization. Every meaningful Hollywood guild has given its top prize to "No Country." But if Academy voters are like regular filmgoers (historically, they only occasionally have been), then maybe they go with their hearts. Maybe they say "Look, we resisted the temptation to go with 'Little Miss Sunshine last year, but this year we're trusting our hearts." It would be a huge upset, obviously, not in the least because "Juno" would then take best picture probably as one of only two wins. Should Win/ Will Win: I finally finished my Best Films of 2007 list yesterday and "No Country" was my top choice. I'd be really pleased to see the best picture Oscar go to the movie I thought was the best of the year. That probably hasn't happened since... dunno... "Schindler's List"?